At first called KV Gruppe Loire, later on promoted to Festung Saint-Nazaire. 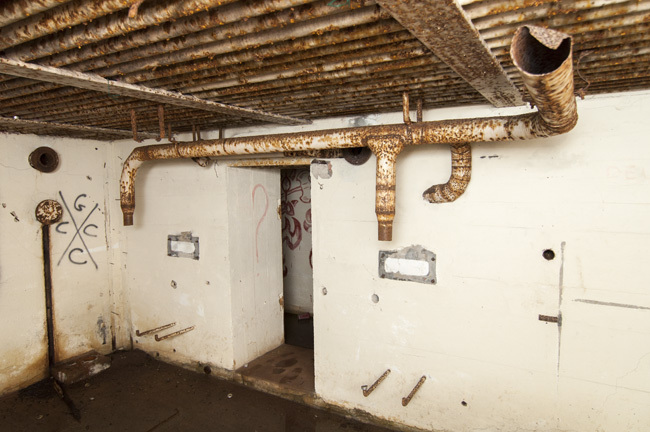 In this area many bunkers remain and in some cases complete with armoured parts, such as plates and cupolas. A few inland batteries were built and with them the supporting bunkers for observation. The harbour is worth the while because of the U-boatbunker (UBB) and the lock bunker with the massive and unique 40P8 Sechschartenturm on top. The Flak command bunkers with towers (type Fl 241 and Fl 250) for the AA-batteries are typical for this Festung. The strongpoints have the designation "N" or "Nz", of which N 57, the inland battery "Heinrich", is one of our favorites. We spend in total three full weeks in this area and we are certain to have missed other beauties (1999 and 2002). Many additional pictures were made by Henk Adriaanse in 2005 and we made another tour in 2010. An extra third ventilator in the corner of a 502. It's common in this area of the Atlantikwall.